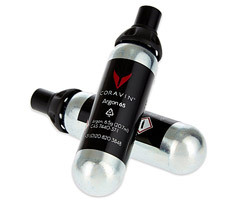 Coravin Two Capsules Pack Coravin Capsules are specifically designed for use with all Coravin Systems, ensuring the perfect seal and the perfect pour every time. 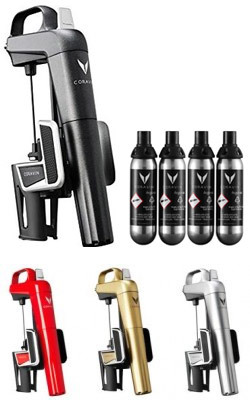 Pressurizing bottles with argon gas to pour wine a glass at a time, Coravin Capsules are the power source of the Coravin System, and a fundamental component of the Coravin Technology. 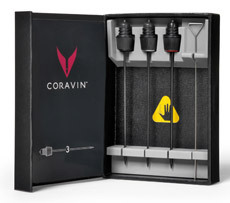 Coravin Standard Needle Specially designed hollow needles are a key component to Coravin’s technology. Each needle is stainless steel and Teflon® coated, providing durability and easy insertion over hundreds of pours. However, should your needle need to be replaced, the Standard Replacement Needle is identical to what was initially included with your Coravin System. Coravin Faster Pour Needle The Faster Pour needle is wider than our standard needle and is designed to provide a quick pour from bottles with corks that are in good condition. The faster pour needle is over 20% faster than the Standard Needle. 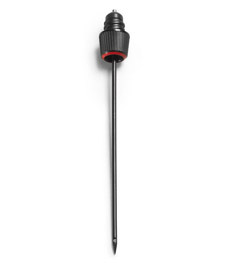 Coravin Vintage Cork Needle The Vintage Cork Needle is thinner than our Standard needle and is designed for the older vintage bottles in your collection that may have a fragile cork. The thinner needle will be gentler on the cork. This results in a slightly slower pour than the Standard Needle, but patience has its rewards! Coravin 3 Needle Kit The Coravin Three Needle Kit contains three different Coravin Wine System needles, providing you with a needle for any bottle or situation. All Coravin Wine System Needles are stainless steel and Teflon™ coated, providing durability and easy insertion for over hundreds of pours. 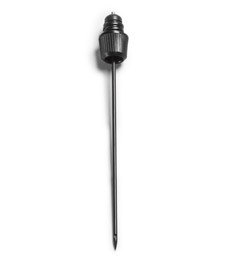 Faster Pour Needle: a slightly wider gauge, this needle will pour a glass of wine more quickly from bottles with corks that are in good condition. Vintage Cork Needle: with a slightly thinner gauge, this needle is designed to access the older bottles in your collection that may have a fragile or delicate cork. Standard Replacement Needle: the same needle that comes standard with each Coravin System, this needle can replace your original needle should it become worn or misplaced. 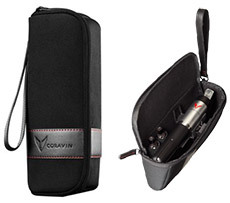 Coravin Carrying Case Designed especially for the Coravin System, this durable and stylish carry case is a convenient way to bring your Coravin System from place to place. The soft-lined carry case is compact, for easy transport of your Coravin System plus inside are pockets for holding two additional gas capsules.